Looking for a camping spot in the woods with easy access to some of the Flagstaff area's fantastic trails and recreation opportunities along US 180? 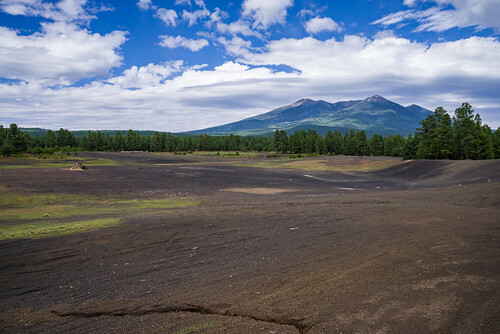 The Wing Mountain area southwest of the San Francisco Peaks offers fantastic dispersed camping along Forest Roads (FRs) 222 and 171, suitable for tents, campers, and recreational vehicles. Wing Mountain is a prominent cinder cone volcano located approximately six miles southwest of the San Francisco Peaks, rising to an elevation of 8,560 feet. The mountain is surrounded by ponderosa pine forest on fairly level terrain at approximately 7,600 feet. FR 222 and FR 171: Easy to navigate, with fairly smooth, wide dirt roads offering areas where you may pull your vehicle and rig up to 300 feet off the road (refered to as "camping corridors" on the Motor Vehicle Use Map). Western end of FR 222A (between FR 171 and FR 519): Easy to navigate and offers areas suitable for everything from tents to recreational vehicles. Warning: there is a section of FR 222A that requires high clearance and four wheel drive where it crosses a burned section of forest. Northern end of FR 222A (near FR 222) and western end of FR 9001P (near FR 171): These roads are narrower and rougher, and more suited to tent or small trailer camping. Hover mouse cursor over image to display slideshow controls. Roads are closed in the winter, from approximately mid-December to early April. The area is open forest and accessible 24 hours a day. No fees or permits are required for dispersed camping on the Coconino National Forest. No permits are required for dispersed camping on the Coconino National Forest. Motorized vehicles may drive and park up to 300 feet off Forest Roads only in areas marked as camping corridors on the Motor Vehicle Use Map. Campfires must be extinguished cold to the touch and may not be left unattended. You are required to carry a shovel and enough water to extinguish your campfire. You may camp up to 14 days per month on the Forest. See Dispersed Camping Guidelines for more tips and regulations. Dispersed Camping Guidelines: tips, rules, and regulations for camping out in the woods. Dispersed Camping Sites: A list of the most notable dispersed camping areas. Motor Vehicle Use Map: A free must-have resource for your forest adventures. Areas designated as "camping corridors" are marked on the map, making it easy to discover other places to camp not mentioned on our website. Flagstaff to Forest Road 222 via US 180 (map): Drive north on US 180 for 8.7 miles. Turn left on FR 222 (1.3 miles past Snowbowl Road). The dispersed camping area begins here and extends most of FR 222 (6.5 miles), and along FR 171 between FR 222 and FR 222A (to the south). Flagstaff to Forest Road 171 via I-40 (map): Drive east on I-40 for 10 miles from the I-17/I-40 interchange. Take exit 185 toward Belmont. Turn right onto Transwestern Road, then left on Brannigan Park Road. Drive for 0.8 miles and turn right onto Forest Road 171. Drive 1.1 mile to the southern end of the dispersed camping area at the junction of FR 171 and FR 222A. The dispersed camping area extends up FR 171 for two miles to FR 222, and most of the lenghth of FR 222. There are also additional dispersed camping corridors along FR 171 north of FR 222 in the Lava River Cave area. Many areas can accomodate recreational vehicles: FRs 222, 171, and the western end of 222A are (generally) easy to navigate and have several established campsites with sufficient space for large vehicles and trailers. There are no designated campsites or facilities. No water. No restrooms. Dispersed camping is camping out wild and free in the woods. Bring everything you need. Take everything you bring. Bring an axe, shovel, and an extra 10-15 gallons of water to extinguish your fire. Chop large pieces of wood into smaller pieces that will fit in your fire ring. Drown your fire, stir it with a shovel, and drown it again until you can the remaining wood and ash with your hand. No trash service available. Bring trash bags, and pack out all garbage you brought with you. Do not burn trash, toilet paper or human waste. Do not remove limbs from trees or cut live trees. Select dead and downed wood and branches at least a 100 yards from your camp. Camping on the forest is allowed for up to 14 days within a 30-day period. Make sure your campfire is out cold to the touch.